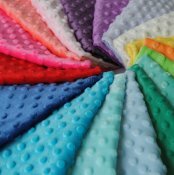 Shannon Cuddle® minky fabric has a textured, velvety surface. Features an adorable dimple embossed design. Suitable for apparel, quilting, baby products, home décor, pet accessories, and more. 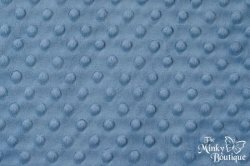 100% polyester, 58/60" wide, 370 grams, 3mm pile, made in Korea. Machine wash cold, tumble dry low.